Isn't she pretty? This is Daphne Selfe in the 1950s. 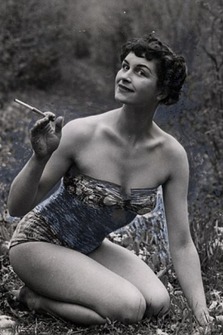 She is still modeling now in her 80s and is considered Britain's oldest supermodel. I applaud this woman, she has never had any cosmetic surgery and considers her hair her fortune. This is Daphne now. These photos were taken for a fundraising project featuring lingerie by Bordelle, based in the UK. I applaud this woman, she has never had any cosmetic surgery and considers her hair her fortune.I think she looks beautiful. "Courageous, original and breathtakingly beautiful, the portrait series by UK photographer Perou was conceived to help promote Oxfam‘s “Big Bra Hunt“, which will recycle used bras donated by British women to support anti-poverty efforts in Senegal. 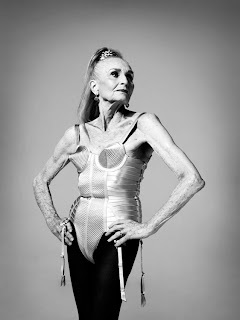 Daphne, the self-described “world’s oldest supermodel”, wears a replica version of Jean Paul Gaultier‘s legendary 1990s conical bodysuit designed for Madonna. The version in these pictures was created by Bordelle, which is accepting custom orders of the replica suit, with profits going to the Oxfam project." Fantastic!! I too applaud her. How beautiful then and now.